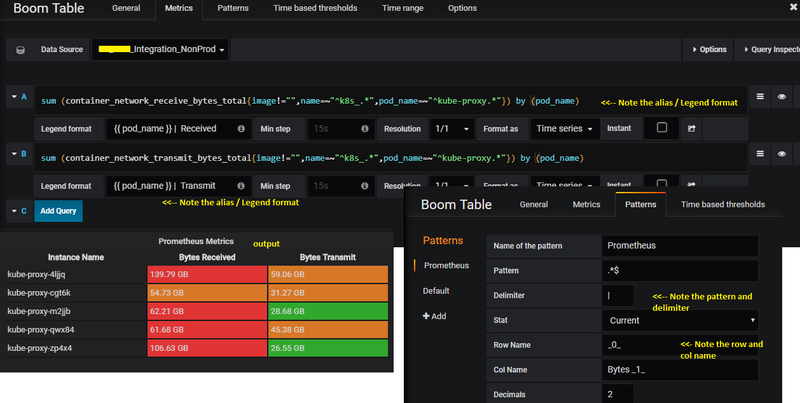 Boom Table Panel for Grafana. 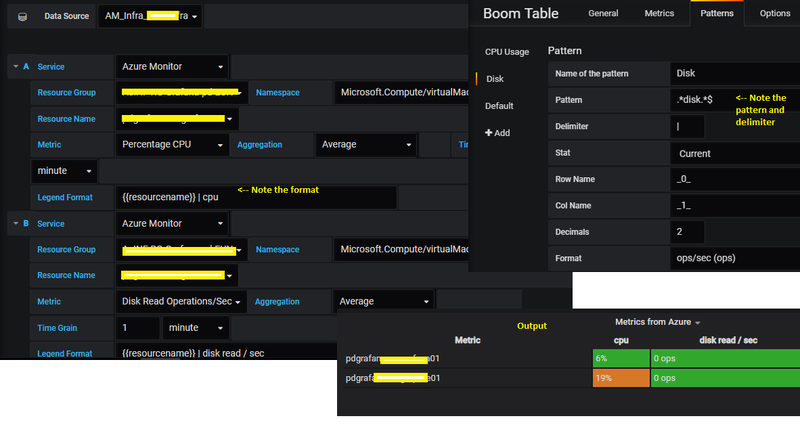 Table/MultiStat plugin with multiple columns for Graphite, InfluDB, Prometheus, Azure Monitor. Individual cell values can be transformed to helpful texts, based on pattern. Pattern are regular expressions / name of the metrics. If there are multiple matching patterns, first match will be considered. To see the matching patterns, enable debug mode in Options panel. Note : If you prefer to change the wrapper from "" to somthing like "~" or "_", you can do it through the option "Row / Column indentification wrapper" in options tab. Thresholds are numbers seperated by comma. There can be multiple thresholds. Thresholds can be overriden, based on day and time of the browser. Multiple time based threshold rules can be set for any given pattern. If multiple rule matches, last rule wins. If no rule matches, default thresholds will be applicable. Example given below. Name : Can be any representation in string but not more than 60 characters. On : Days seperated by comma. Order doesnt matter. Examples; "Sat,Sun", "Mon,Sun,Tue"
WARNING: "From" and "To" fields will be compared against timestamp of last data received from server. If the last data point is not availble, then browser time will be considered. TIPS : If your threshold time rage ranges between two day, (example: 2300 of saturday to 0230 of sunday), then split the rule into two each for saturdary and sunday. NOTE : If you specify n number threshold levels in default pattern (ex: 20,30),then time based thresholds should also follow same number of levels. Works the same way as single stat panel. Background color is a list of colors seperated by pipe symbol. Colors can be named or hexadecimal colors or rgb or rgba. Number of colors should be greater than the number of thresholds. Background colors can be overriden for specific values by using the pattern option Enable BG Color overrides for specific value?. Override values should be specified in the BG Color Overrides in the following format. If multiple matches found, first one will win. Value and colors are seperated by ->. Multiple combination of values can be given seperated by |. If background colors based on thresholds also specified along with this, this will be override the threshold based pattern. Logic is same as background color. But the value to be displayed can be altered here. Display value will be replaced with the value provided. Values are seperated by pipe. if the value is wrapped with _, then it will represent the actual value. _row_name_ will be replaced by row name. This will be useful when you hide the first column. _col_name_ will be replaced by col name. This will be useful when you hide the table header. Transform values can be overriden for specific values by using the pattern option Enable value transform overrides?. Override values should be specified in the Value transform Overrides in the following format. If multiple matches found, first one will win. Value and transform values are seperated by ->. Multiple combination of values can be given seperated by |. If transform values based on thresholds also specified along with this, this will be override the threshold based pattern. Table cells can be clickable and open links in new tabs. If the URL contains _row_name_, it will be replaced by row name. If the URL contains _col_name_, it will be replaced by col name. Note : If the row_name / col_name contains font awesome keywords like _fa-circle_, they will be ignored. If your output have more rows and if you require to hide certain rows based on their output value, you can use the filter option to hide those rows. If your row name / col name / transform metrics contains strings that starts with _fa- and ends with _, then they will be replaced with corresponding font awesome icons grafana supported. Example usage given below. If your row name / col name / transform metrics contains strings that starts with _img- and ends with _, then they will be replaced with images. Example usage given below. Note : When using images from other domains, please take care of CORS policy, legal and copyright polices. Text alignment for first column -> This option specify the text alignment of first column cells in the table. Can be left,right or center. Default is left. Text alignment for table header -> This option specify the text alignment of table headers excluding first column. Can be left,right or center. Default is left. Text alignment for values -> This option specify the text alignment of value cells in the table. Can be left,right or center. Default is left. Non matching cells text -> If no series matches for the given row and col match, the corresponding text can be specified using this option. This option can also contain font awesome and image replacement tokens. Though this plugin was initially designed to support graphite, It is also capable of handling timeseries database like influxDB. In order to achieve this, you need to alias your timeseries/InfluxDB metrics to some proper delimited format. Following screenshot explains plugin usage with influxdb where the metrics are aliased with dot delimiter.This can be any delimiter like space, dot, etc. Same as other time series data sources. You need to properly format your legend to extract the row and column name.